in the First Cataract of the Nile River. Bigeh (Arabic: بجح‎; Ancient Egyptian znmwt) is an island and archaeological site situated along the Nile River in historic Nubia, and within the Aswan Governorate of southern Egypt. The island has been situated in the reservoir of the Old Aswan Dam, since the dam's initial completion in 1902. It was formerly an island in the First Cataract of the Nile River, and its fortification controlled the access to ancient Upper Egypt and Nubia. It is a World Heritage Site, located close to Philae and Agilkia Islands and their ancient archaeological sites in the reservoir. 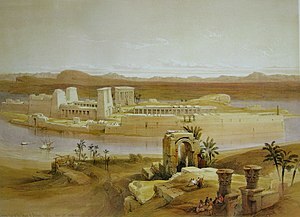 Bigeh island was sacred to the ancient Egyptians. They believed that Osiris was buried on the island, and a temple that stood on it was known as Abaton, Greek for "untrodden place", because only priests were allowed to set foot there. The temple was mentioned by both Seneca and Lucan. The god Thoth bore the epithets of "Great and Splendid God in Bigeh" and "He that Pacifies the Nsr.t in Bigeh". It is thought that there may have been a temple of Thoth on the island. Bigeh island ruins in the Old Aswan Dam reservoir. ^ Dijkstra, Jitse H. F. (2008). Philae and the End of Ancient Egyptian Religion. Peeters. p. 202. Wikimedia Commons has media related to Island of Bigeh.